Four hands, two voices, one mind. 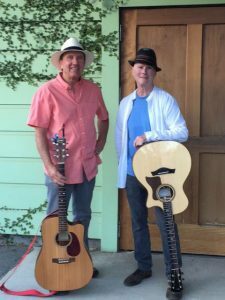 Michael and Kim began performing as an acoustic duo in late 2016 and since then have grown their repertoire and fan base by leaps and bounds. The song choices reflect their diverse musical backgrounds. Michael is the rock and pop devotee, while Kim cut his teeth on R&B, soul and surf music. Together, it’s a remarkable pastiche of classic rock, soul and R&B spanning the last 65 years of popular music. This show has something for everybody.